Every American deserves access to our country's cities-it's the law. But what does it really mean for a city to be accessible? 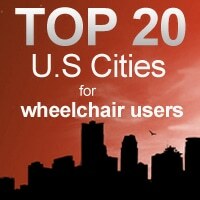 To get a better understanding of how cities in the U.S. are faring when it comes to accessible living, The Christopher & Dana Reeve Foundation looked at 100 of some of the largest cities in the United States and ranked them based on criteria that provides a snapshot of not just accessibility, but livability for people using wheelchairs. First we looked at how hospitable a city's climate is for those living with paralysis and tried to avoid cities with extremes in temperature or snowfall. Then we ranked the cities based on their air quality, number of physicians, rehab specialists and rehab centers, accessible fitness and recreation facilities and paratransit systems. We also looked to see if the city population contained large numbers of physically disabled people and whether those people have been able to get employment. Lastly, we examined the age of the city (old building are harder to make accessible) and checked out the spending and eligibility requirements for Medicaid. What we wound up with was a list of twenty cities that are on the right track for offering hospitable environments for people in wheelchairs. This doesn't mean that these 20 cities, or any of the cities in this country, don't have some work to do. "We have raised the bar for what people who need access are entitled to," says Dot E. Nary, a research assistant and activist at The University of Kansas's Project Workout on Wheels. "Before the ADA, disability was viewed as a personal frailty but now people recognize that we shouldn't have to accept the things we've had to in the past." That means re-defining the word 'accessible' to truly represent access for everyone. Cities are required to make public transportation accessible to everyone, but there are still people who struggle to navigate our urban systems. "Even if a transit system is listed as accessible, it still may be very difficult to use it if you are in a wheelchair or other assistive device," says Yochai Eisenberg, an urban planner and Project Coordinator at the Department of Disability and Human Development at the University of Illinois at Chicago. "People tell us about the lifts on buses not working, or buses passing them by because they are in a wheelchair, or elevators at train stations being out of service for long periods." Eisenberg is working on a Healthy Community Mapping System for the city of Chicago which maps out the 'actual' accessibility of buildings, fitness centers, sidewalks and stores. We've heard stories of people who struggle to cross busy urban streets due to high lips on supposedly 'accessible' sidewalk curbs, but projects like the Healthy Community Mapping System help people navigate urban streets with greater ease, something that cities across the country should consider adopting. Universal Design emphasizes elements such as wide doorways and flat entryways to allow accessibility to everyone from the elderly to those in strollers or wheelchairs. When it comes to building or fixing housing structures in our cities Universal Design should be universally adopted. It's not housing for the disabled, it's housing for everyone and cities like New Orleans have embraced Universal Design post-Katrina. But many developers are resistant to adopt it because they claim it costs more to special-order wider doors or to create flat entryways. "It's hard to convince builders to spend the money on Universal Design because when it is done well, it's invisible," says Cynthia Jones, Director of The Center for an Accessible Society. "How does one market something you can't see or show off? Developers can show you a granite countertop, but how do you show off an invisible feature like Universal Design?" The key to reducing the cost of Universal Design is increasing its adoption -- the more we build with wider doors, the cheaper those doors become. And architects like Emory Baldwin understand that Universal Design needn't only be used for wheelchair access -- his award winning Craftsman style house in Seattle is a wonderful example of invisible Universal Design that anyone would feel comfortable living with. Asking if a building is "accessible" isn't good enough -- learn to ask the right questions, like 'How wide are your doorways?' or 'Is the bathroom on the first floor?'. "There is no organized way to check whether something is truly accessible," says Nary, who has been in situations where her wheelchair couldn't fit into an accessible hotel room bathroom. "We have to be our own police when it comes to ADA compliance." Independent Living Centers can be a lifeline for people who are moving or even visiting a new city-they can offer first-hand advice when it comes to navigating a city's public transportation system, finding a gym to join or housing referrals. To find a center in your city, go to www.independentliving.org or try googling the words "independent living center" with your city name. Dealer Locator - Find the closest dealer to your area. Frequently Asked Questions - Find an answer to your question.